It ain’t cookin’, it’s meal makin’. Seriously, I rarely “cook,” mostly I just put semi-homemade things together and call it a meal. On an indoor grill, I cooked turkey patties, then vegetables that had been marinated in Italian dressing. At the same time, frozen sweet potato fries were crisping in the oven. Main meals need 4-6 different food groups to be balanced. Learn more about Rate Your Plate here. 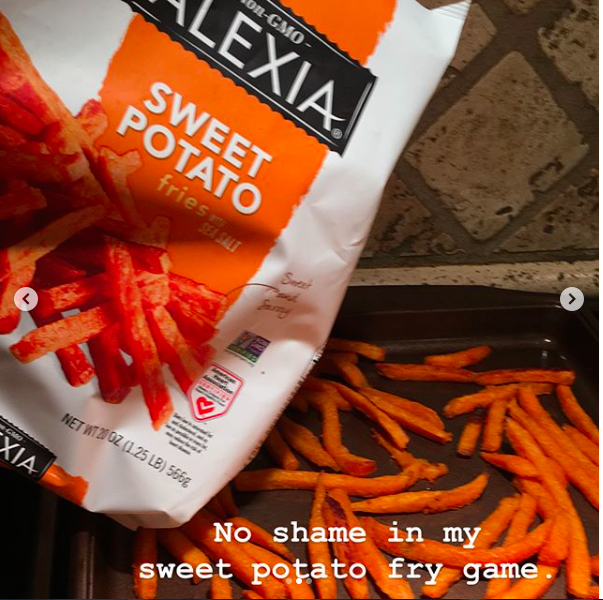 This sweet potato fry brand can be found in the frozen section of major grocery stores. I have no affiliation.